Hi! 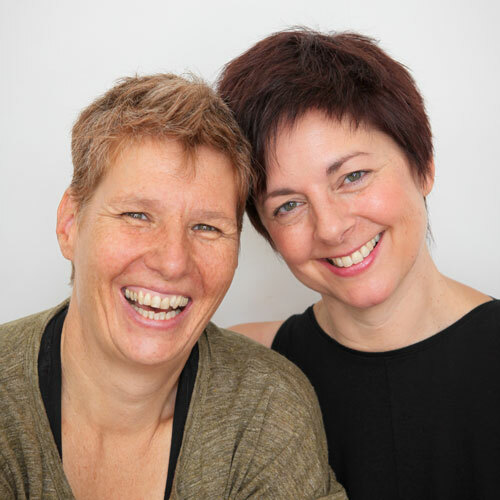 We’re Juna Guetter and Sabine Hildebrandt, Intuitive Coaches and Gypsies of Consciousness, committed to helping you live your magical, true-to-you life in communion with your body and the earth. We ignited our business, Synergy In Motion, in 2006 to help you to connect to your passion, power and purpose through interactive workshops. The original Synergy included Juna the dancer and Sabine the life coach working together to create greater than the sum of our individual efforts. Today, Synergy is the acknowledgment that YOU are not alone. We are living in a holographic universe where change in one area creates change in another. And most important, Synergy is about bringing all the parts of YOU together, and emboldening you to create your life as if by magic. In Motion has always been about the way we move you from having a life to living the fullest expression of you! Ever since its inception, Synergy In Motion has always been dedicated to engaging the gifts of your body and the earth in your choices for conscious living. Most important, we believe that nothing changes or can grow without movement of some kind. It’s been a wild ride for the last decade as we grew our business in unconventional ways, traveled the globe, studied with some of the best self-help gurus and thought leaders of our time, and opened up more consciousness and possibilities for people, their bodies and the earth. Now more than ever, our message is clear. You are a gift. It’s now time to be the leader in your life. Your body and the earth are allies to generative living, so it’s time to claim and honor them as the powerful resources they are. We need conscious leaders who walk on this earth in communion with their bodies, all beings, seen and unseen and the earth itself. Are you IN? Let us show you how. When you are living true-to-you, you become the Synergy that changes and creates worlds. Juna is a Mover and Connector of Possibilities. Most remarkably, she’s been inspiring and facilitating individuals and groups for over 25 years in the fields of dance, conscious embodiment, and personal empowerment. Naturally, she invites you into greater joy, ease and communion with your body and your life. Having studied and achieved professional status in various techniques including Reflexology, Psychotherapy, Education, Social Work, NLP, Landmark Education, Nia™ (Black Belt), EFT, and Access Consciousness®, Juna is a catalyst that sparks people into being the greatness of who they truly are. Furthermore, Juna is a dynamic force with the skills and kindness to facilitate with a gentle whisper. Similarly, she invites you to explore uncharted territories feeling secure and confident. Sabine is a Creator of Possibilities. Skilled in the arts, healing, metaphysics, facilitating, gardening, photography, carpentry, web design, graphic design and business, she defies labels. Over the past 25 years, Sabine’s affinity for adventure has led her on journeys with consciousness and community living where many wouldn’t dare to go. Consequently, her keen sense of curiosity has led to in-depth training with the Essenes; living and teaching in the Findhorn Foundation in Scotland; studying NLP; Facilitating the Transformation Game®, Transformation Therapy, and Access Consciousness®, among many other modalities. Most noteworthy, Sabine is a presence of laser sharp awareness, wisdom, kindness and humour. Likewise, she is the catalyst that allows you to see your situation from a different perspective and change it. You are one of the Curious Ones . . . a Creator, a Seeker, or a Leader. Being in service to others at the exclusion of you, may be taking a toll on your body. For example, stress, accidents, depression, illness or fatigue are your body’s signs letting you know something’s not working. Bottom line, there’s a deep desire to BE and to CREATE what lights you up, and if it changes the world? Bonus! If this describes you and what you’re looking for in your life, we specialize in exactly this! Guiding you expertly through The Tools, The Craft and The Art of living true-to-you. From here, you can be, do, have and create anything you want.